Welcome to WhereAmI.org, Sam Brown’s scrapbook on the interwebs. I’m traveling again. WhereAmI started off as a travel blog. Rather, a ‘homepage’. That’s what we called pages like this back when we had to uploaded files with command line FTP, uphill both ways, through the snow. 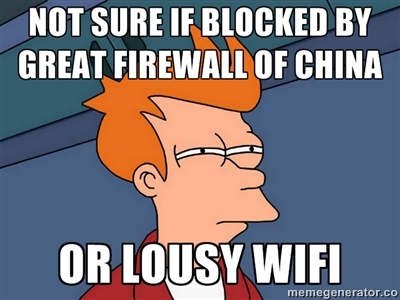 I can’t get to the usual social networks, since I’m running around China at present, and the Great Firewall blocks social networks like FacePlus, InstaTwit, and the rest. So you’re not going to see me in the usual places for a while. If you’d like to keep up, stop in here.